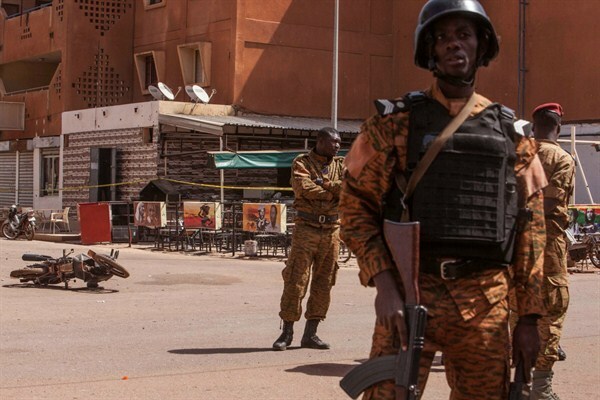 Burkina Faso troops provide security following an attack in January 2016 by Islamist extremists, one of several high-profile strikes in West Africa in recent years, Ouagadougou, Burkina Faso, Jan. 18, 2016 (AP photo by Theo Renaut). During his visit last week to northern Mali, Emmanuel Macron, France’s new president, announced that he would attend the next meeting of the G5 Sahel, a grouping of five countries—Mauritania, Mali, Burkina Faso, Niger and Chad—focused on mobilizing against extremist militants in the Sahel region. The G5 Sahel was originally created in February 2014, and plans for a multinational military force were announced the following year, at a November 2015 summit meeting in Chad. Since then, however, few details have been made available on the force’s composition and how it will operate. In an email interview, Nicolas Desgrais, a researcher at the Brussels School of International Studies at the University of Kent, explains the security threats in the region and how the force might help to contain them.